In the past week or so, at least four armed robberies in various locations have been reported, including that of an elderly woman lured out of her home late at night by robbers who shut off her electricity, police said. In response, Capt. 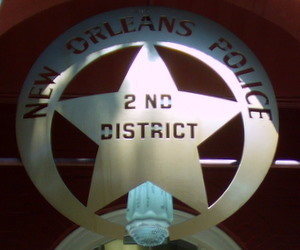 Darryl Albert of the NOPD Second District assigned two officers to an unmarked car to look for possible suspects on the streets, with a cadre of backup nearby, he said at the district’s weekly meeting Wednesday morning. Near the intersection of Fontainebleau and Vendome, they saw a bicyclist who seemed agitated by their presence pull over and make a cell phone call, Albert said. Within seconds, a blue Nissan Maxima was “on their bumper,” flashing its lights at them and honking its horn, Albert said. The officers called in the backup, but as they did so, the occupants of the Nissan began shooting at them, Albert said. The officers shot back and manage to get their vehicle away, but the Maxima swung around for another exchange of gunfire before speeding off, Albert said. Neither officer was hit, but one bullet struck the passenger seat an inch away from the officer’s shoulder, Albert said. Albert said he thinks the shooters mistook the officers for people in the neighborhood looking to buy drugs, and had planned to rob them. After signalling the Nissan in for the robbery, the bicyclist likely would have likely joined in and made a third attacker, Albert said. Police have several leads in the case that they’ll be following up today, Albert said. The Nissan had a speciality “environmental” license plate, one of the officers recognized one of the shooters from a previous stop, and both thought they’d seen the Nissan in a driveway in the area during an earlier part of the patrols, Albert said. The undercover patrols were prompted by a spate of recent robberies that already had Albert concerned, he said, specifically the home-invasion robbery early Friday morning in the 7900 block of Walmsley. An 80-year-old woman was at home alone when her power went out, and when she went outside to check the breaker, two men with their faces obscured by hoodies pulled low were waiting for her, police said. One had a gun, a revolver, and they took her inside and stole an expensive TV and $120 in cash before leaving, police said. The woman’s dog was barking quite a bit prior to the robbery, Albert said. To prevent robbers from using this tactic more frequently, Albert suggested residents be wary if their power suddenly goes out. If it’s early enough, call your neighbor to see if theirs did as well, he said, and ask them to accompany you to check your breaker. If it happens late at night, and the other homes in your neighborhood still seem to have power, call police before going outside, he suggested. The other armed robberies took place in several different locations. One last week, at the corner of South Lopez and Martin Luther King Boulevard, was someone walking to the Hanger Bar, so Albert met with the bar owners this week to talk about increasing the bar’s security in the streets nearby for patrons. Bar owners were “very cooperative,” Albert said. After another armed robbery, in the 2200 block of South Gayoso, officers later saw two people fitting the description of the suspects and tried to stop them, but they ran away. In a third robbery this week in the 7100 block of Walmsley, the victim was coming home from the store with her daughter, and the robber appeared at her doorstep with a gun and said, “Give me your purse or I’ll shoot your daughter,” Albert said. The victim pushed her daughter inside and dropped her purse, and the robber took it and ran away, Albert said. At least some of the cases are probably linked, Albert said. Police have identified suspects in several, but haven’t been able to arrest them because the victims were unable to identify them, Albert said. Even so, police will be watching those suspects very closely, he said. Many thanks to the 2nd District police officers for their vigilance. I was held up at gunpoint on June 28th, late at night outside my home on Audubon Street. After the robber took my purse and a ring I wore, he ordered me into a side yard, and ordered me on my knees. Instead, I screamed “Help” as loud as I could. It scared him, and he ran, apparently crossing Broadway, and going through the Neron Place/Fern Street neighborhood (Some of my purse’s contents were scattered in those yards.). I went inside, and first tried to reach the security patrol, and remembered that Mondays were their “off” nights. I called 911, and the 2nd District police officers and detectives were there within 15 minutes. They took down my description of the robber and his weapon, and gave me advice about improving the lighting around the house. Later, I helped put together a composite sketch of the robber. As far as I know, this robber is still at large, but may have robbed someone else (with an accomplice) in the Fontainebleau area within the last month or so.